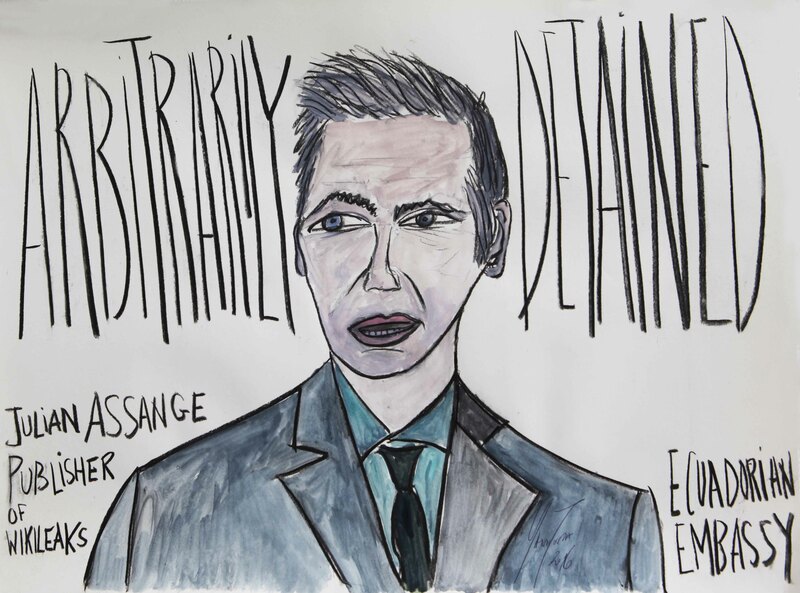 Yann Toma makes political drawings since September 2014 as part of the General Assembly at the UN. On an invitation from the ICJ (Centre for Investigative Journalism), his recordings have found a new dimension in December 2014. 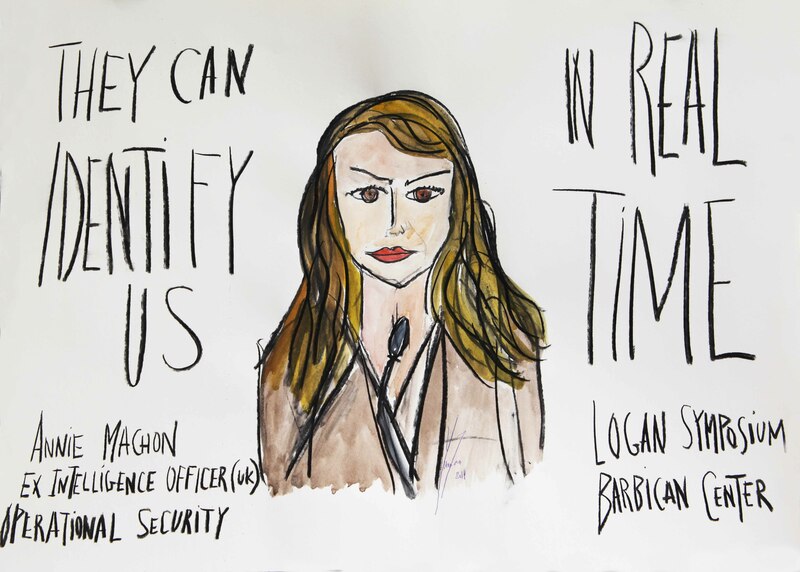 The artist, equipped with charcoals and watercolors, recorded the entire Logan Symposium, an international conference which gathered personalities key in the fight against invasive surveillance and censorship, including internet leaders like Julian Assange. That inaugural event brought together leading journalists and hacktivists who decided on this occasion, to form a natural alliance, opposed to an authoritarian world that undermines the privacy and freedom of expression. Seeking common ground, journalists offer hacktivists a common social and political context, as well as expertise by an argument based on evidence. Hacktivists, experts in data access, have shed new light on freedom of expression in digital. 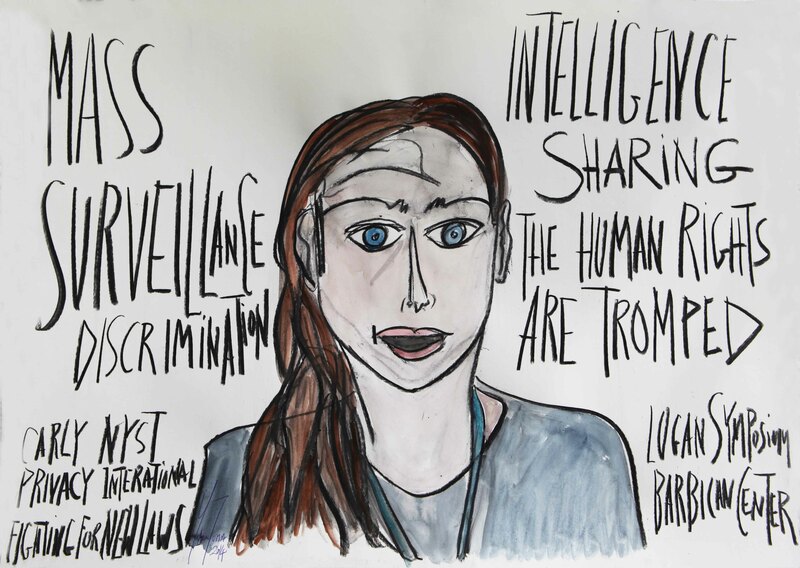 These designs, mixing portraits and meaningful sentences captured on the spot, decode the datas of reality and reveal another reality of actors who mobilize against the policy of surveillance and censorship. 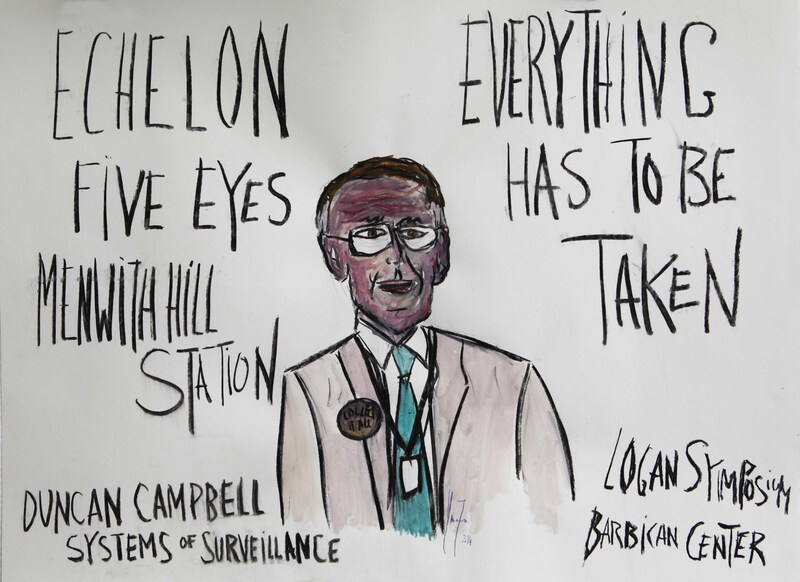 Originally shared online tweeter with hundreds of thousands of people, this new series brings new light on the Logan Symposium and feeds the debate on whistleblowers. Laura Flanders, Everybody is watching us on line, 45,7 x 61 cm, 2014. Anne Machon, They can identify US, 45,7 x 61 cm, 2014. Carly Nyst, The Human Rights are tromped, 45,7 x 61 cm, 2014. 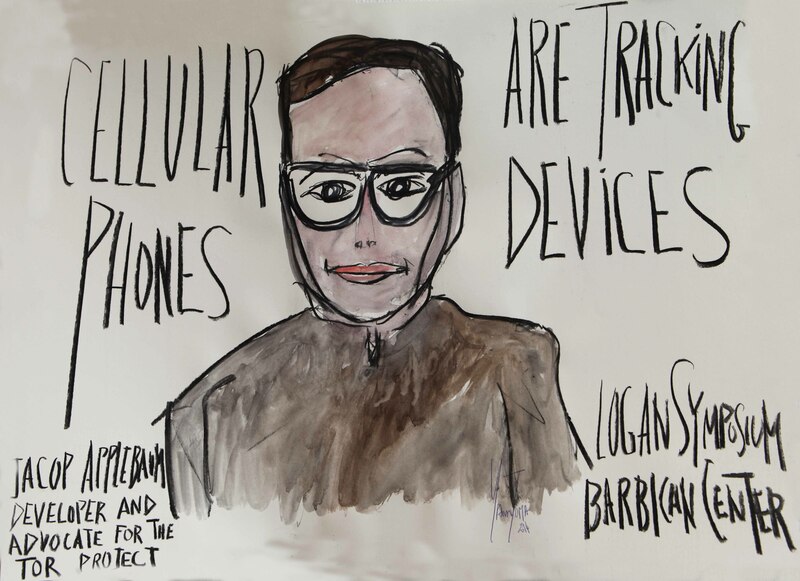 Jacop Appelbaum, Cellular Phones are tracking devices, 45,7 x 61 cm, 2014.Julian Assange, Arbitrarily Detained, 45,7 x 61 cm, 2014. Duncan Campbell, Everything has to be taken, 45,7 x 61 cm, 2014. Caroline Nevejan, Our challenges are Imagination, 45,7 x 61 cm, 2014. 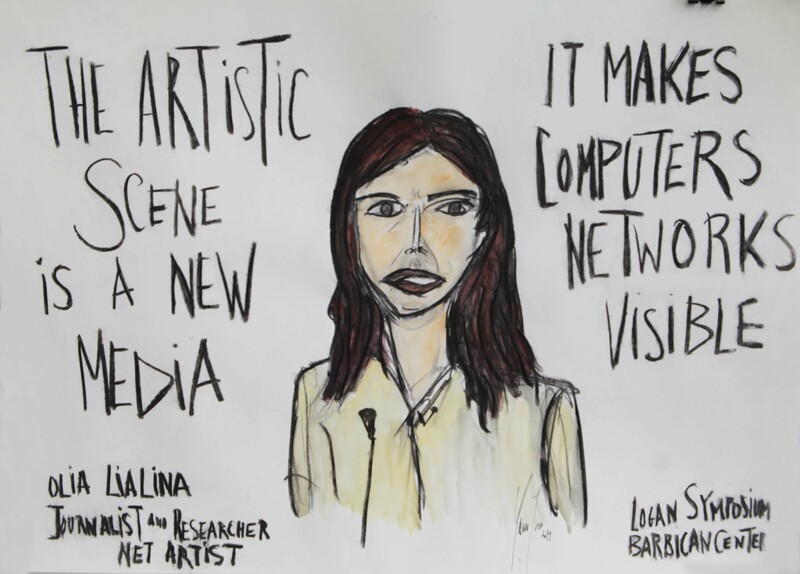 Olia Lialina, The artistic Scene is a new media, 45,7 x 61 cm, 2014. 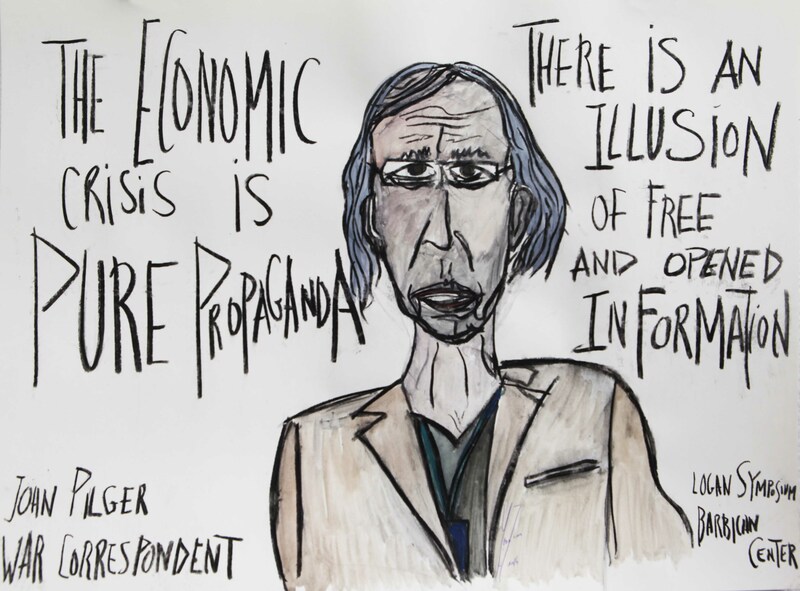 Jonh Pilger, The economic crisis is a pure propaganda, 45,7 x 61 cm, 2014. Yann Toma is a French contemporary artist and a researcher. He positions his work and his reflection on the border of the artistic expression, always involved in political and social events. By salvaging material from former electric power company Ouest-Lumière in the early 1990s, he has appropriated a symbolic network, an industrial infrastructure which he turned into his research territory and the very matter of his activity.The artist is also a PHD professor and a researcher in University of Paris 1 Pantheon-Sorbonne where he manages the team of research CNRS (French national center for scientific research), named ” Art & Flux ” which is as much a look-out post, an observatory of theoretical and critical research, as a laboratory of experiment and artistic production. Art & Flux (Art and Flows) reports in a critical way what connects the art, the economy and the society. He is the author of the collective work Les entreprises critiques (” The critical companies “) and of Artistes & Entreprises (Artists & Companies). Toma, president for life of Ouest Lumière, is also an artist-observer within the U.N where he sits as an entrepreneurial artist.The artistic work of Toma is part of numerous collections. His work is integrated in particular into the collection of Centre Georges Pompidou and was put in the inventory of the National Art Collection of Contemporary Art in 2007. He is represented by the Bourouina Gallery Germany, in Berlin. A monography, entitled “Yann Toma” (texts, conversations, 700 photos and illustrations), went out to September 2011 which presents the extent of his work and artistic flux of the President for life of Ouest-Lumière. His personal participative exhibition in the Grand Palais Dynamo-Fukushima (in September 2011) gathered more than 17,000 visitors in two days. The French national memorial created for the centennial of the WWI is the last monumental artwork of the artist. At night, the monument called L’Anneau de la mémoire becomes La Grande Veilleuse (“The Great Wake Light”) and the memory of 580,000 soldiers keeps shining when the visitors are gone. For the Cop21 in 2015 Yann Toma transformed the Tour Eiffel in a giant energetic antenna : HUMAN ENERGY, in order to affirm the climate emergency and invite us to reflect on the rôle of art as a possible engine for global change. In early 2016, he has continued his captation work at the Logan Symposium at the Berlin BBC.